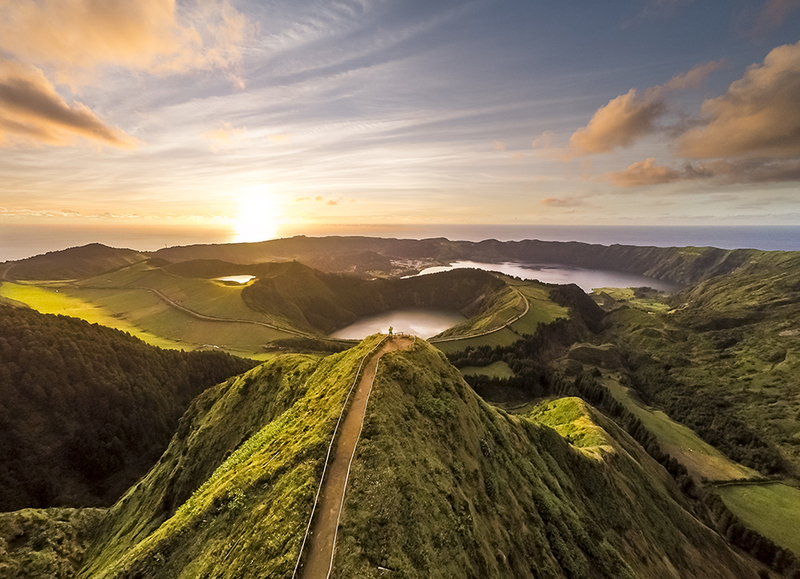 The Azores Archipelago is one of the most surprising regions in Portugal. Among its 9 isles, it offers lush fields which seem to come from Ireland itself; legendary lakes; an architectural landscape raising from the coast in big whimsical mountain ranges. This archipelago, located in the middle of the Atlantic, is made up by a compound of 9 islands (São Miguel Island, Santa Maria Island,Terceira Island,Graciosa Island,Faial Island, Pico Island, São Jorge Island, Flores Island and Corvo Island), and counts with a total surface of 2,322 square kilometres. Its geographical centre is 1,402 kilometres away from Lisbon, and 3,910 km from New York. Although it is part of the volcanic compound of the Macaronesia, same as Madeira and the Canary Island, it is a more Northern latitude (around 1100 kilometres North from Madeira). Therefore, the climate is much wetter and more rainy; and the current of the Gulf of Mexico softens the temperatures. 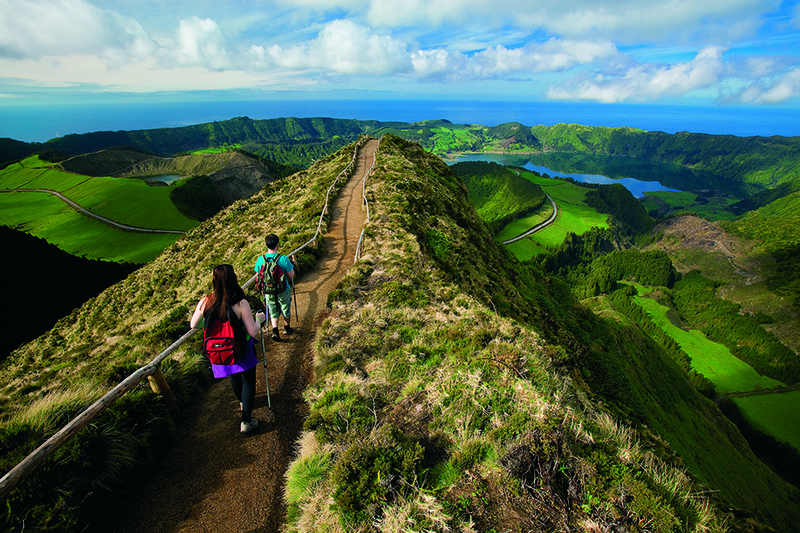 Azores focuses its touristic offer mainly in sustainable one. Evidence of this is the nature preserved without artificiality, and the lack of highly populated areas. In addition, it counts with a safe quiet environment and a gentle population. 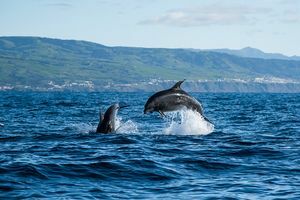 Unlike the Madeira or Canary archipelagos, where urbanisation has clearly damaged the coastal landscapes and packed out the destinations, this region has preserved its natural heritage. 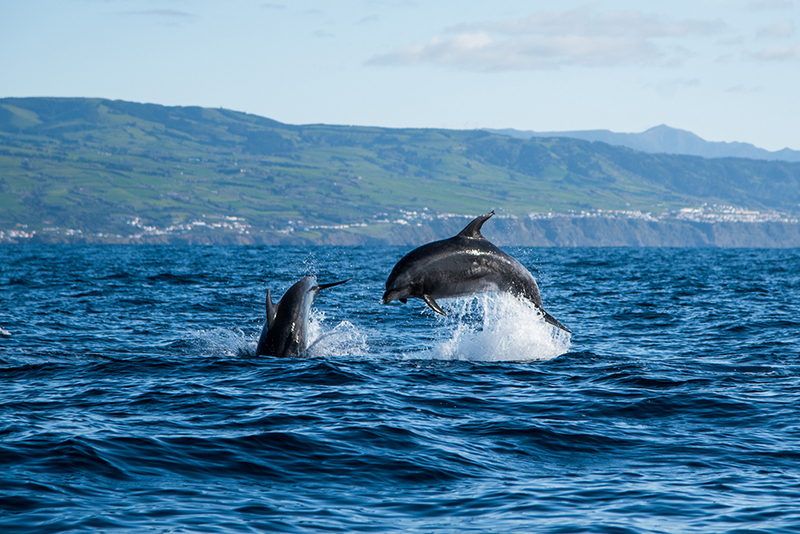 Azores does not attract tons of tourists to its beaches, mainly by the lack of guaranteed sunshine; but it offers ecological tourism, where the sight of surprising birds and whales makes up for activities such as fishing or hunting. Instead of sun, beaches and big hotel complexes, it offers green tourism, hiking, peace, smaller hotels and rural accommodations. Some of the must visit places are: Sete Cidades and its lakes, Frunas and the Lagoa do Fogo Lake, in the island of San Miguel; the São Lourenço Bay, in the island of Sata María; Angra do Heroismo and Algar do Cãrvao, in Terceira; Santa Cruz and Furna do Enxofre, in the Isla Graciosa; Hora, Caldeira and Capelinhos in the Island do Faial; the climate of the Island of Pico; CAldeão, in the island of Corvo, and the islands of San Jorge and Flores. 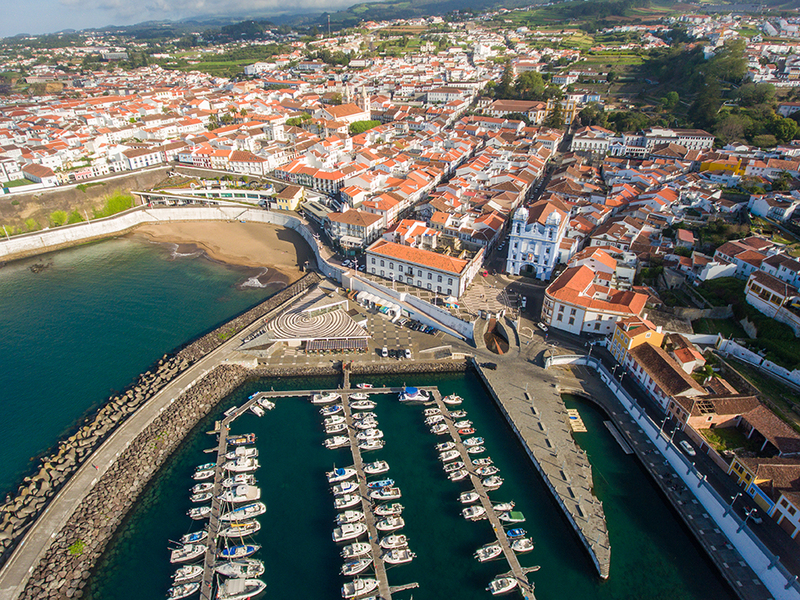 Regarding the cuisine, in Azores you will have the chance to taste exquisite seafood, such as the cavaco, a sort of prawn without pincers and with a delicious taste. One of the most popular dishes in this islands is the lapa, which is grilled and is accompanied with rice and a garlic and parsley sauce, or with Afonso molho sauce. In this islands there is also have a great variety of fishes you can try, flatfish, rockfish, oily fish, sharks, tuna, etc. As for meats, there is a native cold-cut known as lunguiça; while the home-made morcela is served with inhame, an African tuber similar to the potato, yet sweeter. If you visit the island of San Miguel do not miss tasting the famous Furnas Stews. It is important to remember that here, time-zone is different than in Spain (2 hours less), and also than in continental Portugal (1 hour less). Due to the distance between the continent and the archipelago, travelling is limited to planes, which take only two hours from the airports of Porto and Lisbon, and about two hours and a half from Madrid. Plane can be kind of pricey when travelling between the islands, so it is advised to go by boat and check beforehand the regular lines so you can organize your holidays.